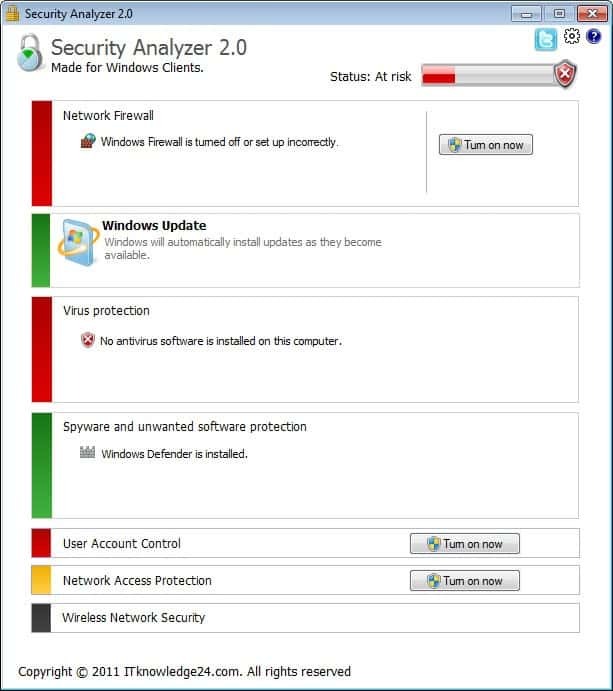 Security Analyzer is a free program for the Windows operating system to assess the system's security status. The application works in some regards identical to Microsoft's Action Center control panel applet. Unlike Microsoft's built-in tool, it provides additional information and options to see if the system is protected properly. The program runs a quick scan once you start it on your system. The information gathered from the scan are displayed in the program interface, along with a general assessment of the system's security. Network Firewall: If a firewall is running on the system. Looks at Windows Firewall in particular to see if it is turned on and configured properly. Windows Update: Whether automatic Windows Updates are enabled on the system. Spyware: If an anti-spyware program is installed and running on the system. User Account Control: Whether UAC is turned on or off. Wireless Network Security: Analyzes the encryption of the wireless connection. Disabled on PCs without wireless adapter. The overall system security status is displayed at the top, and the status of individual settings and programs in colors next to each setting. Red indicates a feature that is either turned off, not installed or mis-configured, and green that the settings are protecting the system properly. Some settings were not properly identified on the test system. The User Account Control for instance was shown as turned off, even though it was turned on (but moved one slider down to block the dimming of the desktop during prompts). The Microsoft Security Essentials installation was not detected by Security Analyzer, which in turn gave the system an "at risk" rating in this department as well. Buttons are displayed for some features to turn them on again. This is the case for Windows Firewall, the User Account Control and Network Access Protection. Security Analyzer is compatible with all recent 32-bit and 64-bit editions of the Microsoft Windows operating system. and full hardware/software report including software keys/licenses. This tool can’t even detect Microsoft’s own AV? This is why Microsoft software has a reputation for being an utter joke.